Its all temperature anyway. If Canada is cold then Lotus will probably struggle a bit,they struggle on all colder tracks & love hotter one's. Mercedes does better in colder conditions. Canada theoretically should be Mercedes' strongest race but RBR,Ferrari,Mclaren & Lotus will be challengers each race with a few mid-field teams mixing it out as all teams are VERY VERY close this time. RBR & Ferrari are rumoured to bring their version of DDRS which should bring them big benefits. I hope Mercedes abandon their exhauts & bring the Mclaren exhausts. @Kingofeverythingclassy wrote: Its all temperature anyway. If Canada is cold then Lotus will probably struggle a bit,they struggle on all colder tracks & love hotter one's. Mercedes does better in colder conditions. yea mercedes eats tyres if the track temp. is hot but the recent updates in monaco and they had brought quite significant ones, with new carbon gearbox case, new revised sidepod, revised front wing/ and some updates on rear areas ... with rear updates they seems to have overcome some of degradation issues, certainly in other tracks it will test them.quite a big update for mercedes this week, i reckon they will bring few in canada too. but yea ur right mercedes might come really good in canada. but like u said its so much unpredictable. because i thought red bull having best car when it comes to high speed circuit willl blow the rest of field away , turned out lotus and williams and ferrari were miles better. meanwhile lewis have pushed team to keep up with other teams so they might bring some updates, so will ferrari but ferrari had quite a hefty upgrade brought already since spanish gp, even few of them were brought in bahrain so we are looking atm a much improved ferrari especially their traction/rear/exhaust problem seems to have improved a lot and they have certainly benefitted a lot from hideously poor car but thanks to former bridgestone tyre engineer that ferrari recruited this year, he has given a massive improvement when it comes to tyre management thats my belief, ... and oh... in monaco red bull was complained by ferrari mclaren and mercedes as reported, that red bull slot near the tires is illegal, though not official protest, and if FIA give clarification i reckon all top team will bring new updates like red bull had in monaco/bahrain. btw loic bigois is released from team so since geoff wilis took over, i believe with him mercedes will be very strong... im big fan of geoff since BAR days. so im pretty sure mercedes focus is on tyre studies and aero areas where they are weak atm. 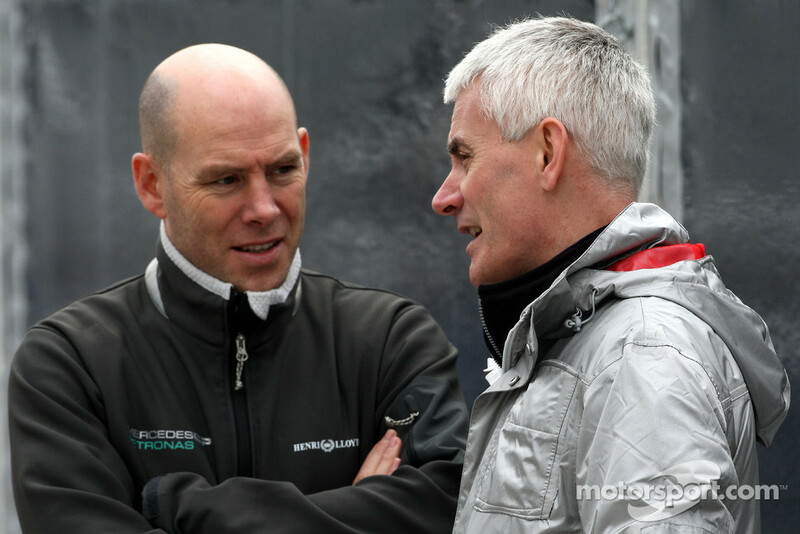 As far as I know Mercedes are poaching Renault's Head of Aero who has been working under Allison. Should be a great capture as Renault aerodynamically has produced a great car for their limited resources. But every week some car failure for Michael or some noob like Grosjean screwing it up is ridiculous. I doubt if I have seen anyone this unlucky. @Kingofeverythingclassy wrote: As far as I know Mercedes are poaching Renault's Head of Aero who has been working under Allison. Should be a great capture as Renault aerodynamically has produced a great car for their limited resources. thats great news, really ... geoff willis is already a great aerodynamicist but atm maybe since Bigois is dismissed maybe he is overlooking both at aero and technology and research his current mail role area. well either way thats great news, if he comes. thanks for bringing great news man, appreciate it. that i agree with, grosjean keeps getting in trouble. in 6 races 3 of them he have been with michael . well canada is a track that suits perfectly for mercedes, and for mclaren too, on temperature, canada temp is quite low normally, i dont know how forecast will be but normally if ambient temp is around 24-25 thats perfect for mercedes. and there has been lot of talk that mercedes has gotten over tyre temp. issues so lets see. maybe its not the car being the reason why team had previous issues with temp. maybe its got lot to do with their own understanding and setups. in australia they overheated tyres, in malaysia they had big trouble getting heat on tyres quite the opposite to australia. also number of recent updates may help a lot. 61 - The number of points Michael Schumacher has sacrificed in 2012. Retirement. Vettel took it too easy in the beginning and both their pit stops Strategy were horrendous. But Alonso's race Perfection...I've never seen a race driven better. Last couple of months, i use to watch it all the time in the 90s but slowly grew tired of it. awesome race, what i thought would be one of the most boring race ever, thanks to s...ty pirelli tyres. lol at maldonado thanks to him michael got podium, and its special day for ferrari because ferrari had all former and current driver in schumi kimi and alonso in the podium and all those drivers were managed by race engineer Andrea Stella; so for him it is a really special day. for schumi podium after 6 years but god that mercedes is piss poor when fuelled full during the first/second stint in race day, not taking tire management into account which is their another nightmare. only when fuel is starting to go off in latter stage, it comes alive close to performing qualy like pace. something needs to be done about it. so convinced that red bull , vettel would have won by big margin if he hadnt had some sort of engine problem, same problem existed for grosjean too with both of their cars engine just switched off. that RB8 with upgrades for this race, pulled off amazing like 0.5 s off the second place hamilton when vettel had pole, they had some updates here with brakes and in rear but already some suspects going on with that car. "He tried to put me off the track," said Maldonado. "He didn't leave any room for me to stay on and do the corner side by side. I jumped over the kerb and I couldn't avoid the accident." The Venezuelan felt Hamilton should have accepted that he was going to get overtaken as his McLaren's pace faded. "I don't know why he drove like that," Maldonado said. "He was struggling too much with the tyres. He was completely lost and at that moment I was getting very good pace. He tried a very aggressive move on me." when pirelli says we could make the tires last longer, and durable thats what most fans want. everyone loved bridgestone for that. Agree Jesp, more meant the entertainment factor. lol @ luca montezemolo... he was not happy man when ferrari qualified like 11, and he flew back home, only to miss a special ferrari day today , with all current and former employees (alonso, kimi, michael ex-ferrari drivers) in podium lol... busted...! @Great Leader Sprucenuce wrote: Agree Jesp, more meant the entertainment factor. blame that to vibe .... who sponsors inter... though, i admit it is entertaining but its so mixed bag atm, its rather confusing lol, i mean for example if u were in betting business in f1 atm , then rest assured people would have lost a house by now!!! Only the second race I've watched this season, this was superb. Alonso's drive was phenomenal. only his 3rd finish out of 8 races!!! @JespSwe wrote: awesome race, what i thought would be one of the most boring race ever, thanks to s...ty pirelli tyres. I am pretty sure that Mercedes are Very VERY good on Full Fuel tanks & Decently Good in Tyre Wear. MSC was on used Softs in his last sting while Webber had a fresh one & he kept the Red Bull behind & he was the only doing good times with his Hard Tyres in the 1st Stint. Also I felt Michael's first sting was Extra-ordinary. Nobody worked their Hard Tyres well. And had not the Safety Car allowed 6-7-8 odd slow laps especially at the start of the new tyre cycles those tyres would been finished 3-4 laps earilier ATLEAST. Michael was 4s off Rosberg after 20 odd laps with an absolutely DUD Prime Tyre while guys like Perez who have good tyre wear abandoned their Hard Tyre wear & even a guy like Jenson who is good at managing the tyres could do run with it. This happened on full tanks & I think Rosberg's pace was consistent. Rosberg made a Horrible Start & in general was nothing great in his 1st stint & was average after the SC re-start. Average race for him. And the reason why Michael was had NEW Tyres & Fresh because he did his 1st Stint with Hards when everyone had Softs & he made his sting lasts a long time with not a Major degradation. Other than that RB8 had 0.4 off Hamilton in Q3 but never managed that gap in Q2 or Q1. Maybe it was a Special Vettel Lap,Red Bull setting their car better for lower fuel or Hamilton not getting it 100% right,tyres,temperatues & a lot of factors. Red Bull were certainly quick but not 0.4 off a second. Red Bull will naturally be quick in the 1st section as due to the Renault Engine they start on a much lesser fuel consumption. I think if a Mclaren or a Ferrari had the lead & could have held vettel for the first few laps or till the 1st Stop they would have won for sure. Red Bull is for me a tenth or 2 quick than the rest. I think everyone HATED the fact that Bridgestones never degraded. I think it was bad too for the spot. That aspect of Pirelli is fantastic. The problem for me is the tyre window is too narrow & it changes on cars from track to track & from car to car. Changes at different temperatures & does not work well at either a very high or a very low temperature. Too many marbles (thank god a bit less this year). And this people doing Slow Laps initially to make the tyres last is bad. If they want to make the tyres last 20 laps. Fine. Maybe from car to car & driver to driver it will vary from 18 to 22. But that is not the case. Temperatures are causing huge changes in performance & wear patterns. And Lotus might do 50 Strong laps with a tyres other teams can do 30. This is bad. think tyre wear is not the problem. getting performance out of tires is the biggest problem for everyone. changes from track to track, temp. even if teams get their setup right for the race, say few drop in temp will stop the tires working at optium level anyway. i dont like this when we havent seen pure performance of the car at best , and everything depends on tires . its not pirelli fault either because they are doing what they were told to do. kobayashi will face 5 place grid penalty for causing avoidable collision with massa in valencia, 10 grid penalty for verge for doing the same on kovalainen 5 place grid penalty for hulkenburg for gear box change. will be exciting race tomorrow, rain expected.